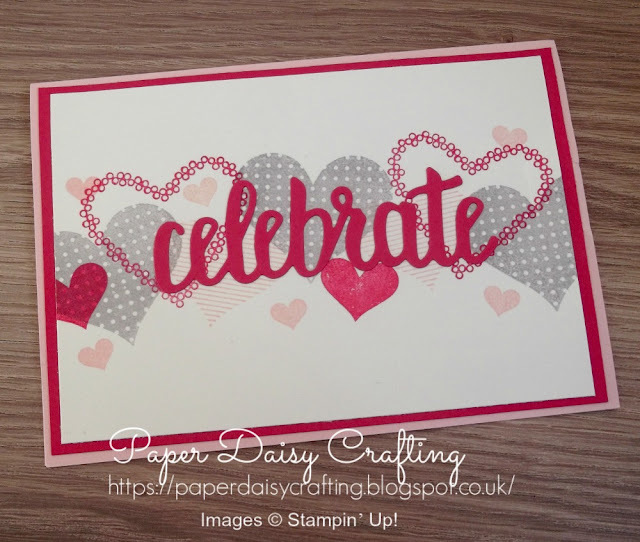 I've said it several times before but joining Stampin' Up! really was one of the best decisions I ever made. I have had such a blast since that day in June 2016. And one of the things that has made it really special is my team leader (or "upline") Caroline Helwigh. I am part of her team, called the Simply Stylish Stampers. Some of you might know her as Craft Caroline. A few weeks ago I earned a Stampin' Up! promotion, which means that I'm now a Silver demo. To congratulate me Caroline sent me a little package of goodies. This card was in it. Isn't it gorgeous? Caroline has used the "Heart Happiness" stamp set, proving that it not just suitable for Valentine cards! And she's used the "Celebrate You" thinlits dies which are available as part of Sale-abration so you can get then FREE - ask me how!! I have another card from Caroline to show you tomorrow - do come back to see it, or even better, subscribe to get an email notification every time I post!